I have been reading about the rising profile of our former President, Dr Goodluck Ebele Jonathan, and wish to state without equivocation that no one should rule him out of the 2019 presidential race. I first hinted this possibility about two months ago and wish to reiterate that Nigerians should prepare for the shock that awaits us. The story of Donald Trump should bring us back to our senses. Nothing is impossible. The second coming of Goodluck Jonathan may be so far-fetched or even belong in those categories of impossibilities but I wish to plead with our government and my fellow citizens not to rule it out. As one of those who made our modest and humble contributions to the coming of this Buhari government, I’m pleading with trepidation. Jonathan’s popularity is rising not because of anything he has done to atone the sins that must have led to his waterloo but as a result of what our "Change Government" has failed or refused to do. The obsession of our government with going all out after Jonathan is the main reason the Otuoke man is beginning to smell like roses after the odoriferous position he landed himself last week. Only if our government had succeeded in maintaining the economy it met, Nigerians would have been ready to enter fire with Buhari. But there are just too many unresolved problems and challenges. The excuses that Jonathan and company left this peculiar mess behind has refused to fly. The groans might not be loud enough to reverberate all the way to the Aso Rock Presidential Villa, as of now, but trust me it may become deafening, sooner than later. I do not care if men and women of power dismiss my submission with a wave of the hand but they should mark my word, there is a thickening conspiracy in the clouds. It would be a shame if we inadvertently play into the hands of those hovering and ready to pounce on Buhari. I read about “persecution complex” long ago and I understand how it works. If you beat your own child so ruthlessly as if you want to kill him, the tilt of public opinion would always go against you. Many would wonder why you want to kill your own child. In our anger, let us pick our fights. There is too much tension in the land. I would be delighted if anyone could educate and convince me that Nigeria has gained much more than we’ve lost to this war of attrition. If we haven’t, we may need to retrace our steps urgently. The BBC reported on Friday how Jonathan caused a stir in Sokoto State during his visit to the state to pay his respects to Ibrahim Dasuki, the late former Sultan of Sokoto. According to the report, Jonathan was received by a large crowd of admirers, some holding banners bearing the words “Come Back Baba Jonathan”. The same voices that chanted “Sai Baba” and “Jonathan Must Go” are now fiddling with the tunes of the possibility of a Jonathan to stage a comeback. Here lies the irony of political triumph and the paradox of high expectations. The euphoria and momentum that saw the exit of Jonathan and the emergence of the Buhari change administration has since begun to wane following the inability of the new government to hit the ground running with the tenacity of a government in a hurry! There are many who believe that the poor management of the ensuing economic recession didn’t help matters. Suddenly, Nigerians who had high hopes and voted massively for change are now caught in a limbo between confusion and uncertainty. As it stands today, the average Nigerian is confronted with the reality of an economic recession they never planned for; a situation they did not experience under the Jonathan administration and under previous governments. Many of President Buhari’s supporters are worried that the humongous goodwill that engineered the Buhari change mantra is now being frittered away at the speed of light. 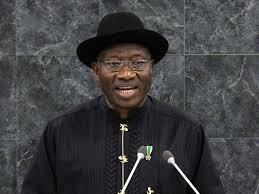 The unfolding plot has now thrown up former President Jonathan as a new protagonist in Nigeria’s theatre of the absurd. For many of us who are ardent students of history, we have since learnt that nothing is impossible in the game called politics. Will history repeat itself again? Time is pregnant with answers!